This is the longest I have gone without writing on my blog since I started it in January this year. Well you know I have been kind of busy......living and...... seemingly dying. In fact, over the last three weeks I have been wired up, strung out, revved up, laid low and revived again. First, my sister and her family visited from London. It was ‘well good’ (oh yes, I now speak like an English teenager!). My young nieces and nephew were teaching me the latest IT concepts as well as the latest slang it seems. Now my Blackberry, Ipod and laptop can do things I would never have thought possible. Then of course there was the 24 hour Olympic coverage. I have never seen so many perfect bodies doing things I never thought possible either. I have previously posted about how I come from a sports mad family. Well we were all a little sleep deprived for a couple of weeks. How many replays can one person tolerate? A lot it seems, particularly when it came to watching one Usain Bolte. But it was another person who got me all inspired. No need for guesses. Michael Phelps was simply amazing. How could you not be inspired. He won more gold medals than most countries will ever see in their Olympic lifetimes. While everyone else was out joining gyms, buying the latest gym gear and signing up their toddlers to the Institute of Sport I was more serious about following in Phelps' footsteps. Well sort of, in a round about way. I was sitting on the couch working hard on consuming 12,000 calories a day. I have to say he makes it look way easier than it is. In fact, it may have been easier to put the Olympic size pool in the backyard and perfect my strokes for hours on end. Then my beautiful daughter visited and while I loved seeing her she arrived with something unexpected. The flu. And, as she has always been the generous sort she also managed to share it with anyone and everyone in her path. It stopped my Olympic training in its tracks. I mean what was the point of strenuous carb loading if I became just another statistic (after all, 36, 000 people die from the flu every year). Oh and I was dying too and I was so happy to share it with anyone that asked me how I was feeling. In her state of guilt, my poor daughter left me with half the products off the pharmacy shelf. In the end it got too exhausting popping pills, measuring cough medicines, taking steam baths, rubbing evil smelling concoctions on every centimetre of exposed flesh I could comfortably reach and sucking on lozenges until my teeth ached. Finally, I just hid under the doona with a box of tissues until the worst passed. Thanks, my dear, you are the gift that keeps on giving. Then, while still in the throes of the deadly flu a friend dropped by with some of her positive thoughts about how she has managed to find calm and inner peace in her life. Just what you need at times like this.... The trick to feel more calm and peaceful apprently is to finish off all the things you have started. “Sounds great”, I said through sniffs. “ I think I will give that a go...tomorrow, next month, next year....”. So when I finally shut the door, I looked around the house to find things I had started and hadn’t finished. There was a bottle of Merlot, the Chardonnay, Baileys, the Vodka, the packet of Pringles, the lemon lime cheesecake, box of chocolates, Valium......thank goodness I decided that peace of mind could probably be better achieved in other ways......like finishing all the flu medications lying around the house.....and getting well. Today I feel a whole lot better. After nearly two weeks you would expect so. I even decided to finish something I had started a few weeks ago. I finally booked the trip to Thailand in November. 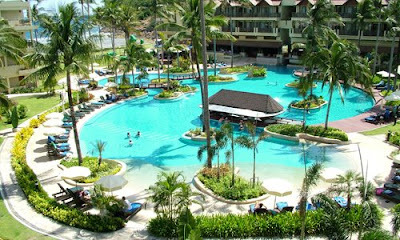 And the Phuket resort we will be staying at has three huge pools (and those beaches). You know what that means don’t you? Oh yes, I have to get back on to my Michael Phelps training schedule – except, I have now faced reality. The Olympic fog and euphoria has now vanished and Lycra is so....so damn unforgiving. I may have to cross off a zero – 12,000 calories may have to become 1,200 calories instead. I will just meditate on this peaceful scene below and start crossing off the days...somehow, I think I will find some inner peace.......after all. You have got to love friends with positive thoughts though....they are truly worth their weight in gold! Wow! You have been busy. I must say I was enthralled by the Olympics, I'm a huge sports fan too. Although all those rippling muscles and gleaming white teeth - that was only the opening ceremony - made me a tad jealous. I've been so preoccupied with moving house etc, that I haven't been to the gym for a month. Do you think you can catch the flu via the internet, we've all had the sniffles too. But being Irish we're also 'well hard' and well used to runny noses and coughs and we're all feeling a lot better. Was starting to think you'd been abducted by aliens, due to your lack of posts. But glad to hear your feeling better, welcome back to the Blogosphere Lilly. Jon, did you notice though that the UK ended up with one more medal than we did and a few more gold!!! London will be so good I am tempted to go there in four years. Good job you Irish are 'well hard' because I wouldn't wish this strain of flu on anyone! And if you do happen to catch it, it has nothing to do with me - the Internet is 'well clever' but not that clever!! Have you got another blog now - have to go check it out!! And you better start preparing your speech to the preschool class - they are a tough audience!!! lol to finishing of those fridge and pantry items....I'm with you! I am glad you are now okay. I was wondering what had happened and if you had given up the blog. Hello Megan from Cairns - oh I culd have done with some of your sun and hot weather over the last few weeks - thank goodness spring is COMING!!!! Thanks for stopping by and no, I cant ever imagine not blogging! Woohoo, glad to have you back in one piece. I missed your posts. Michael Phelps is indeed inspiring but I just looked and didn't make it off the couch. These Olympians are freaks of nature, truly! My favourites were the under dogs, particularly that Aussie diver who beat the Chinese favourite to take gold. Great television! Thailand, lucky you, it is really a fantastic holiday spot. i am very glad to hear that you have completely recovered from that awful flu! your upcoming trip to Thailand sounds fabulous and something to look forward to in a major way!!! your friend is lucky to have found inner peace. @ Sarah - I know what a great win by Matthew - all of them were amazing - talk about pressure on the Chinese though. Great to see you stopping by. @ Nina - hello there - love your new artwork. I have to get me some Mermaids now. Stroke of genius they are! The search for enlightenment is a good one - I think the answer is to not take yourself too seriously and just worry about others and care for them. Suddenly the world is always ok. We really are not that important in the bigger scheme of things. Thanks for dropping by - I am honoured - you must be flat out. Take Care! Hope all the demonstrations have stopped by the time you go there. All the airports are now closed. Beautiful place to visit. Hi, Lilly. Yes the UK had a smashing Olympics,. I think it will be quite difficult to repeat the achievement , but on home soil you never know. I have started a new blog. It's aimed to help people overcome smoking. I'm an ex-smoker and I found it difficult to stop, so I thought why not share my experiences, they might just help someone to quit. I wish I'd never started and I now find it disgusting . My favorite event was the diving without doubt. I could have watched for weeks more. Now we have the Paralympics to look forward to and I fit nicely into luggage just in case you can squeeze me in come November. Jon - great idea for new blog and there are lots of people who need the help. ANd the UK will definitely do better when the Olympics is on home soil - you watch!! What a wonderful blog! I wish I could have joined you in your Olympic training. Perhaps we could have encouraged one another in our carb-consuming goals . . .
Renae - thanks so much for dropping by - I am looking forward to my holiday except the hilarious thing is the day after I booked it I heard news reports that due to deomonstrations in Thailand all the airports are closed and tourists have been stranded in Paradise....hopefully by November the airports are opened again LOL! Reflections Under The Bodhi Tree - I’ve been tagged! Hmm, well I certainly rival Michael Phelps in the calorie consumption stakes...unfortunately am missing the exercise bit. Welcome back lilly! @ Anonymous - yes, the exercise bit, do you think he gets much time to do anything other than eat and exercise - 12,000 calories is a LOT when you look at what he eats each day - good luck to him!! Hope you are better and glad to see you back posting. I enjoyed that post, love your sense of humor. I remembered you commenting in my "Past Lives--Part 13" that you have family visiting you that you've been busy. But I didn't realize that you have been sick also. Even Eric at "Ruminations of a Small Town Boy" is also out of the blogging pictture because of flu illness. I'm glad that you're well and back to blogging again. By the way, I enjoyed reading your post. Your humour put smiles on my face. Hi Tasha - yes this flu is a bad one alright but I am back on the mend. I shall drop by your blog and catch up with what you have been up to and I am missing some chapters of your novel as well. Thanks for dropping by! I was reading your blog last night and today, and at one stage I had to blink and shake my head - I thought I was reading something I might have written. But then, I seem to only post photos. Have you ever found a blog that worte things that you think yourself? I have a mother up in Brisbane too, and have fond memories of Pompeii and of sipping Limoncello - I was at a cafe in Sorrento. Anyway, lovely to find your blog. I really like your photos of the lake... I stayed indoors all weekend, reading PhotoHunt entries and making digital scrapbook pictures about Florence. Leslie - you must write some more as you did in your last post. You have loads of stories to tell I am sure. And yes, it sounds as though we have loads in common. I love your pictures by the way and loved your Francis story. What a home she has! And Antonio - Whoah!! Thanks for dropping by. Henry - yes indeed back to normal blogging thank goodness. It is strange the weather differences. I always look to see what the weather is like in the UK because of my sister and friends there. Seems like you had the wettest summer on record. Does it mean you have to tour less now with Autumn approaching or does it remain the same all year. Thanks for the limoncello link - I will put that up on the post. And no doubt you would not get time to watch the Olympics but its going to mean big changes for England in 2012 I bet. Thanks for dropping by - you always make my day. I loved this post! I'm glad you are feeling better. The flu can be miserable. I liked the idea of following Phelps diet, Lol. Don't I wish! Well, I wish I could swim like him too. It sounds like you have a wonderful vacation to look forward to. I hope you'll share pictures when you come back!